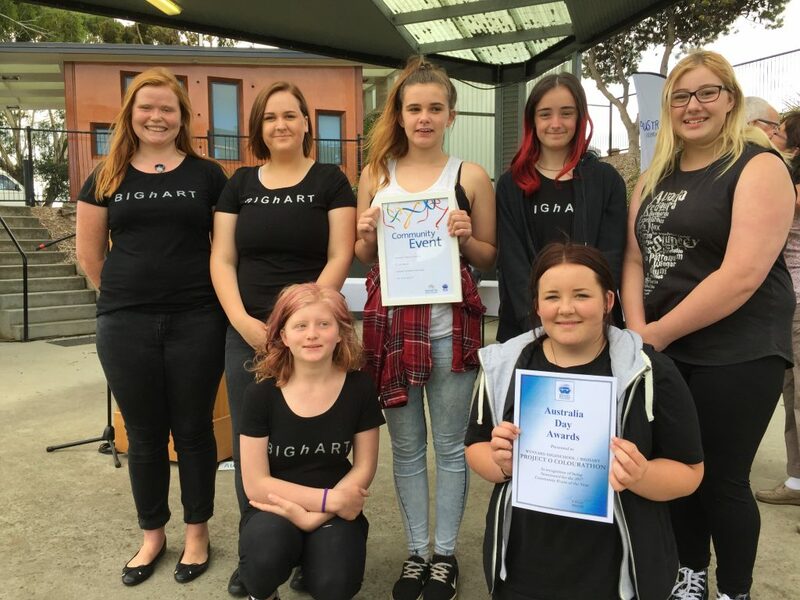 This year Big hART and Project O/ 20+20 was recognised by the local Waratah- Wynyard Council and received the Community Event of the Year Australia Day award. The award was in recognition of the efforts of the young women who produced the world’s first 24hr colouring event – Colourathon – held May 2016 which raised over $13,000 for children in crisis accommodation. 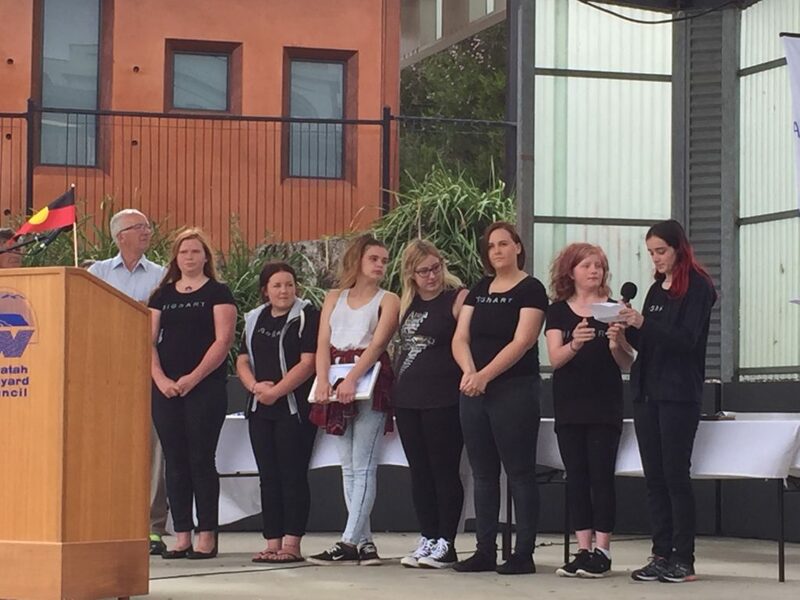 The event also created one of the first opportunities for the young women now in 20+20 to stand up and have an opportunity to be seen as change makers, advocating for issues surrounding family violence. Here’s our speech: “Thank you so much for this acknowledgment of our work last year, and thanks to the council for their ongoing support of our projects. Our colourathon was designed to shed light on children that are affected by family violence in our community, children like us. Because even though, as you all know, we live in an amazing, beautiful and scenic part of the world, there are some parts that are not so great. In May last year when we ran our world first event, it was a positive, fun, family affair and the response from this community was huge, we brought 34 community organisations, schools and sports teams together to colour-in and share stories, and in doing so we took a united stand to raise awareness of the issue of family violence and to raise our voices to do something about it. Every hour that we coloured-in we were sponsored AND supported by our community, from the cafes to the hairdressers to the Football club and the mens shed, from the childcare centre to the ladies from the CWA. More than 20 local businesses donated food, services and money, too many to mention here. These relationships are important to us, they tell us that we are not alone, they send the message that even though we are young, our voices are important. And during that 24hrs our Crowdfunding campaign that originally aimed to raise $6,000, actually raised over $13,000. We partnered with the Australian Childhood Foundation, who are now working with our local shelter to provide staff training as well as a professional play therapist. This outcome will result in generational change for the young people experiencing trauma as a result of family violence. That is real change. We have now graduated from Project O into our new Project called 20+20, we are still focusing on building resilience, to help us build a strong sense of what we want and don’t want in our own lives and in our community. One person can be a catalyst for change, but we know it needs a whole community approach, and in that we know we have your ongoing support. So thank you once again, for acknowledging our efforts”- Maddy, Jasmine,Lauren, Ella, Bri, Chelsea, Angel.